Fighting cats make quite a spectacle. If you own several cats or let your cats outside, you most likely have come across (or will experience) cat fights. Luckily, not all feline disputes end in actual brawls. Cats may do a lot of hissing, yowling and posturing, but somehow they manage to avoid a full-blown skirmish. There are other times, however, when cats do get into physical battles. And they can soon get pretty ugly. Why do cats fight? What do you do if your cats start fighting? How do you handle cat fights? Okay, let’s start with the first question. There are different reasons why cats fight. Know what can cause a cat fight will help you prevent it or at least break it up. Survival instinct. Cats have an innate survival instinct, even if they live at a nice home. Sometimes they act on their instinct by "play fighting". 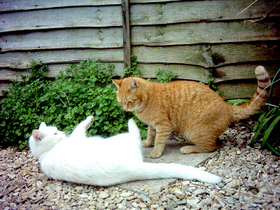 Play-fights are common among kittens. Most cat owners have seen fighting kittens. However, adult cats can also engage in play-fights. For the most part, these fights are not dangerous. Usually, the fighting cats will switch places. The only time I would separate two cats that are play-fighting is when it appears as if the "play-fight" is developing into an actual fight or if one of the cats is being hurt. Establish their supremacy/dominance. In multi-cat households, cats will establish a cat "hierarchy" which can lead to cat fights. Territorial battles. Cats are territorial animals and they guard their territory fiercely. A cat trespassing on another cat’s territory can easily cause a cat fight. Miscellaneous. Cats may start a fight to settle disputes with other cats. Maybe one cat is bothering the other cat, for example. Sexual aggression can also cause fights among cats. My neutered cat used to climb on top of my other cat and simulate the mating act. Of course, such action would end up in a quarrel. Should you interfere in a cat fight? It is usually better to leave the fighting cats to settle their own conflicts. But you know that if they are left to their own devices, cats will hurt themselves. So more often than not, you will have to intervene. How do you separate two cats fighting? Use water. You can squirt both cats with water. A water bottle or water gun can come in very handy. Loud noise. Disctract the quarreling cats by making loud noises. Shout, clap your hands or make a loud sound using a horn or a bell. Throw something. Gently throw them a light pillow or towel. Do not throw heavy objects as they may get hurt. Once the cats are separated, do not attempt to pick them up with your bare hands as they are likely in an aggressive mood. Keep them in separate areas of the home, if possible, until they calm down and cool off. Can you prevent cat fights? I think it’s very difficult to prevent fights among cats, especially if they are let outside. Even with indoor cats, it’s very hard to tell when cats will turn aggressive. Take my cats, for example, they might be the best friends in the world, grooming each other with relish when all of a sudden they’re hissing and growling at each other. Sometimes they start a fight before I can even react. The only thing I can advise you is to be ready to act if and when a fight start. Fortunately, most cats get along pretty well.